The fully waterproof and breathable fishing jacket comes in a ¾ length with a lower, curved back to keep you dry when sat down. There are two lower front bellows design pockets, with stud flaps  large enough for fly boxes or cartridges. Above these are two fleece lined hand-warmer pockets, plus two vertical zipped pockets and an additional mobile phone pocket on the left sleeve. Velcro adjustable cuffs and a 3-panel, adjustable hood, that rolls away into the high collar. All the external zips are top-quality water-resistant models and there are two further zip openings under the arms for ventilation. 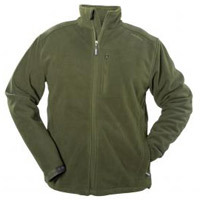 Inside, there is a fleece liner that can be un-zipped and worn as a stand-alone fleece jacket. Truly a jacket for all seasons. Snowbee's popular Breeze-Bloc model with an improved specification. Their new model uses a double layer of high density microfleece with the breathable, waterproof membrane laminated between. Size S 36/38"M 38/40"L 42/44"XL 46/48"XXL 50/52"
Country sportsmen looking for sheer warmth need look no further! 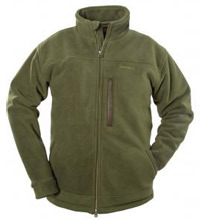 The new Snowbee Country Fleece uses a single brushed polyester fleece on the outside, with a double-brushed fleece on the inside, giving a sheepskin effect lining, which traps a layer of air for additional warmth.